IC Insights has release its forecast ranking of the top 25 semiconductor capital spenders for 2014. A preview of the top 10 spenders is shown in Figure 1. Samsung and Intel are each forecast to spend at least $11.0 billion this year, and TSMC slightly less than $10.0 billion. Collectively the three companies are forecast to account for 51.8% of total semiconductor industry capex this year. As amazing as that number is, it is a decrease from the 55.5% share these three companies held in 2013. Among the top 10, six companies are forecast to spend at least $3.0 billion in 2014, and nine suppliers are forecast to spend more than $1.0 billion. After keeping their combined spending essentially flat in 2013, the top 10 spenders are forecast to boost capex spending by 10% in 2014. After chopping its capital spending by 28% in 2012 and 12% in 2013, SanDisk is forecast to show the largest capital spending percentage increase (86%) among the top 10. The company stated that this large increase is needed to expand production of advanced 3D NAND flash memory with its manufacturing partner Toshiba. While SanDisk’s capital spending level is expected to be much higher than in 2013, this increased spending is not expected to result in a significant boost to its NAND flash capacity levels. It is worth noting that the combined capex spending increase of Toshiba and SanDisk (on account of their joint venture partnership to build flash memory) is forecast to be $1.06 billion in 2014. Capital spending budgets are forecast to increase by $1.0 billion or more at two companies. Micron is expected to be very aggressive by increasing its spending $1.12 billion in 2014. Still, this 58% jump in spending is forecast to be less than the 88% jump in sales revenue the company logged in 2013 (after the inclusion of Elpida’s sales). Also, pure-play foundry GlobalFoundries is expected to increase its semiconductor capital spending by $1.0 billion as well this year. SK Hynix is expected to display an 18% increase in spending in 2014. However, given the company’s excellent sales performance in 2013 (43% growth) and its aggressive rebuilding program for its fire-damaged China DRAM fab, IC Insights believes there is potential upside to this estimate. Some of the most eye-catching numbers are the massive amounts of spending expected by Samsung and Intel over the 2012-2014 timeperiod. Over this three-year period, Samsung is forecast to spend $35.3 billion, with about 60% of this amount targeting memory production. Intel is forecast to be second to Samsung in total outlays over this same time with $32.6 billion in dedicated to capital expenditures. These huge levels of spending are enough for each company to construct and equip eight or nine $4.0 billion leading-edge 300mm wafer fabs. 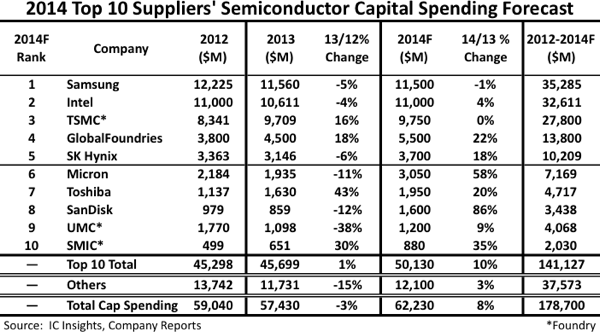 Nine of the top 10 semiconductor industry capital spenders are expected to increase their semiconductor capital expenditures in 2014. In contrast, only four of the top 10 capital spenders increased their spending levels in 2013. Meanwhile, capex spending among “other” suppliers is expected to grow at a much slower 3% rate this year, but that is a marked improvement from the 15% decline registered by the “other” segment in 2013. In the long run, IC Insights believes that “other” companies will likely increase their spending at a lower rate, or decrease their spending at a higher rate, as compared to the top 10 companies as they implement the fabless or “fab-lite” business models for their IC production.